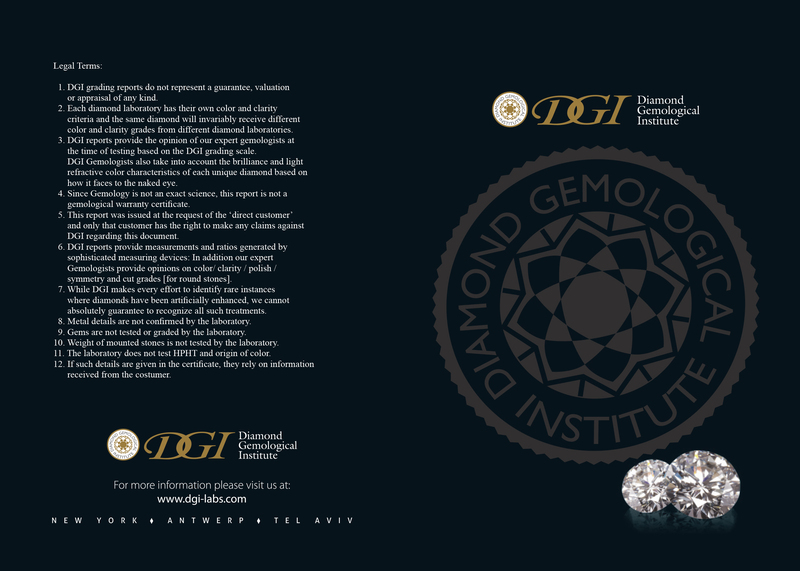 The special exclusive DGI (Diamond Gemological Institute) certificate, for the entire jewellery: the diamond(s) / stone(s) and the metal. Each jewellery so marked in the description on the site, will be accompanied by DGI’s certificate. Unlike the diamond certificate, the information in the jewellery certificate differs, depending on the jewel and metal type. Diamond jewellery has different characteristics than jewellery with other gems. It may also vary between the different types of metals used in jewellery. DGI’s certificate provides a professional appraisal service: an approximated replacement value of the item in US Dollars. You can use this certificate for your own purposes. The appraisals are based on the diamonds gemological grades, therefore they come with a gemological report that states the diamonds 4C’s and all the other gemological information provided in DGI’s certificate. Appraisals are performed according to current Rapaport price list. All appraisals in DGI’s certificates will appear both numeric and by words to prevent confusion. These appraisals are only an estimated assessment based only on the gemological grade of the stone combined with the Rapaport price list. They do not include other market concerned information that may have an effect on the item retail value. Therefore they are not an official evaluation certificate. 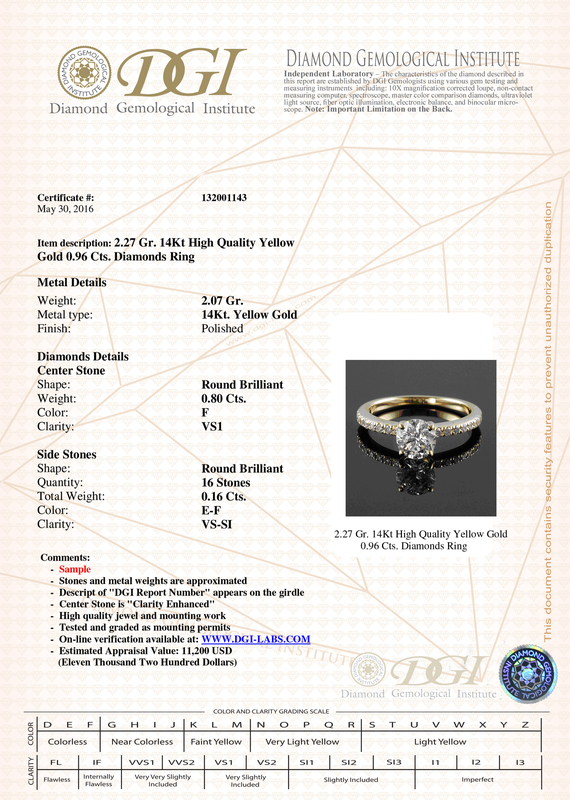 In addition to the gemological information, the certificate displays a photo (or diagram) of the item itself. The date in which the certificate was issued and the report number (for verification) is located on the top of the page inside the certificate.